Emergency management officials work year-round preparing two very important needs for the community, one is for the everyday needs of residents around the county needing Emergency Services by calling 911. Whether it’s a minor event or the beginning of a critical situation, it generally starts with a call to the Emergency Operations Center (EOC). The EOC, under the leadership of Capt. Dave DeCarlo, is home to the 911 Center, Emergency Management Section. In 2007, the Citrus County Emergency Operations Center, specifically the 911 Center, received national accreditation from the Commission on Accreditation for Law Enforcement Agencies' Public Safety Communications Accreditation Program. This achievement is noteworthy because only four other centers in the State of Florida and only 47 centers across the nation have earned this honor. The EOC 911 Center handles all emergency calls for the county. When you place an emergency call, it goes directly to the EOC 911 Center in Lecanto. Dispatchers route these calls to the appropriate service: law enforcement (Sheriff’s Office) and EMS. Using an enhanced 911 system, communications officers are able to determine the address and phone number of the caller. The Citrus County EOC is one of the few 911 centers across the state that effectively and efficiently houses all services together, ensuring that no time is lost in transferring calls. The other is always being on the alert for natural disasters, such as hurricanes, flooding, as well as catastrophic events, like a terrorist attack. Any of these situations could mean some or all of Citrus County is without electrical power, water or other basic necessities. During this time period, it becomes critical that people understand how to take care of themselves for at least 72 hours and have a family disaster plan already in place. 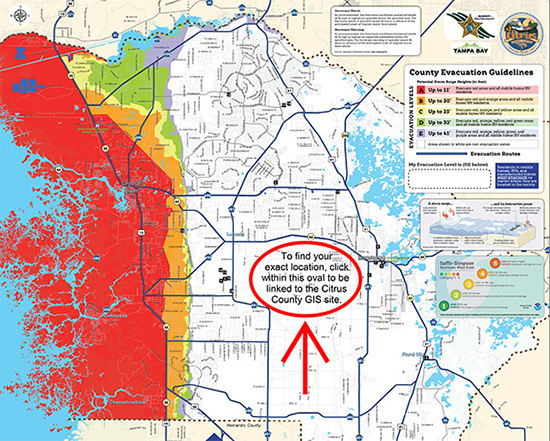 When the EOC activates due to a pending threat, or a disaster strikes, Citizen Information Lines will be staffed. When necessary, these lines are open 24 hours a day. What is CERT? 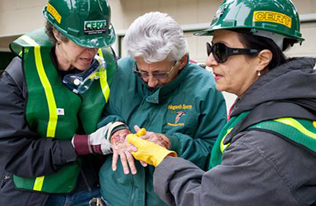 The Community Emergency Response Team (CERT) program trains people to be prepared for emergency situations in their community and neighborhood. 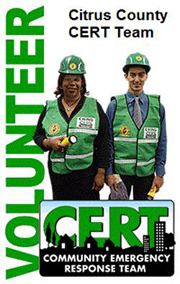 CERT members give critical support to first responders, provide immediate assistance to victims, collect important disaster information and provide that first neighborhood help in the immediate hours following a major emergency. During the initial hours following a disaster, emergency personnel are overloaded, unable to reach areas or are short of workers to respond. Others often have had to pitch in to help persons in their immediate neighborhood. A CERT team is made up of your neighbors and business colleagues whose actions make a difference. Following a 21-hour basic training program and ongoing efforts, the team can manage utilities, put out small fires, provide lifesaving interventions, perform basic search and rescue operations, plus assist in damage assessment, evacuation and rapid sheltering. CERT is active in over 30 Florida counties, and Citrus County offers CERT training through the Sheriff’s Office. Contact the Emergency Management Section at 746-6555 to find out about classes and how your neighborhood can learn to work together. If you or someone you know is disabled or in need of assistance during an evacuation (and is not presently in a nursing home or adult congregate living facility), plans should be made to register with Emergency Management’s special needs program. This program identifies the disability, plus the special equipment or specific assistance needed during an evacuation. If an evacuation is ordered, contact will be made with the special needs person to confirm that assistance is still needed. If it is, specially trained personnel will be sent to aid in the evacuation process. Should you or someone you know need such assistance, please call the Citrus County Sheriff’s Office Emergency Operations Division at 249-2705 or you may call Emergency Management at 746-6555. Lecanto Primary School will be the site for the Pet Friendly Shelter for Citrus County residents. Animal Control will be in charge of this shelter. Download and print our registration form. Plan your evacuation strategy and don’t forget your pet! 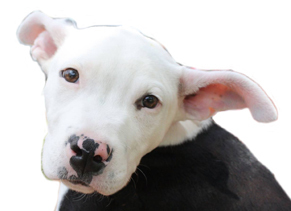 Specialized pet shelters, animal control shelters, veterinary clinics and friends and relatives out of harm’s way are ALL potential refuges for your pet during a disaster. If you plan to shelter your pet, work it into your evacuation route planning. View a list of items needed and things to do to prepare your pet for an evacuation. Before & After the Disaster How Can the Clerk of Court Help? June 1st marks the beginning of Hurricane Season. Hurricanes, as we all know, are natural disasters with the potential of catastrophic consequences. While disasters are not always avoidable, with diligent planning the Clerk of Court is prepared to minimize the impact on services if a disaster strikes. The Clerk has a comprehensive emergency management plan in place to ensure our ability to serve you within 72 hours depending upon the severity of the disaster. Cooperative agreements guarantee alternate locations to conduct business should the courthouse sustain damage. The Clerk participates at the policy table with County officials when decisions are made regarding events that affect all of Citrus County. The Clerk’s Office continuously strives to deliver the highest level of quality customer service while keeping the public informed. In all emergency situations, including but not limited to, inclement weather, natural disasters, or other emergencies; we will post announcements on www.citrusclerk.org and www.facebook.com/CitrusCountyClerk. Local television and radio stations also broadcast information providing citizens and stakeholders the necessary support and communication channels to minimize confusion and ensure restoration of services. 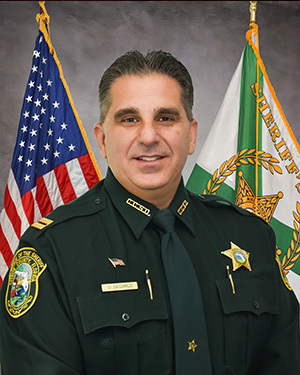 The Clerk utilizes server redundancy offsite (out of county and out of state) to protect all information and to safeguard continuity of critical operations. Continuity of Government operations and Interlocal Agreements are in place with judicial, local, and state government agencies to deliver timely assistance. Living in Florida, we are most often prepared for the threat of a hurricane. Be sure to include a certified deed to your property in your personal hurricane kit or an alternate safe place away from your home. A certified copy of your recorded deed is substantive proof of ownership of your home and/or other property and is a requirement to apply for disaster assistance. To obtain certified copies of your deed or other recorded documents, please visit us in person at the Citrus County Clerk of Court Annex at 120 N Montgomery Avenue, Inverness, FL 34450. You may also access our website online at www.citrusclerk.org, or call our office at 352-341-6424. We are available to serve you Monday through Friday, 8am to 5pm; closed holidays. AMPlifying the message to save lives! information for broadcast to the community on your digital message board. Will we be bombarded with messages to broadcast? Not at all. AMP is designed for severe incidents only. How does our business, not-for-profit or faith based organization join? Click here to download to application. What kind of information is broadcast? Emergency notifications such as severe weather, flooding or evacuations. Is there a cost to join or any special hardware? None at all. We would send you an email and or text message with the important broadcast and all you do is copy it into your digital messaging system .